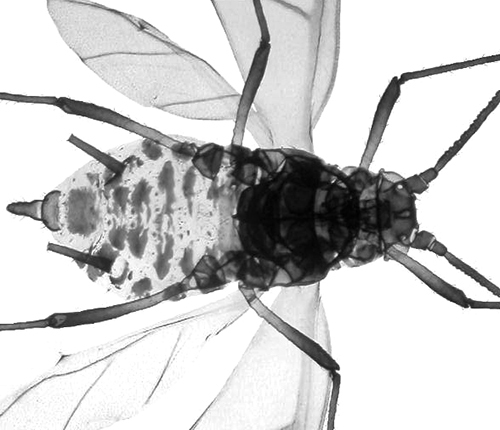 The first image (below) is a micrograph of the adult aptera in alcohol. 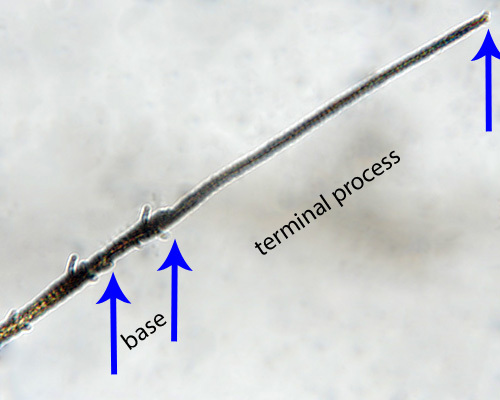 The second picture shows the lengths of the terminal process (PT) and base of antennal segment VI for a specimen of Nasonovia compositellae ssp. compositellae from the north of Scotland. 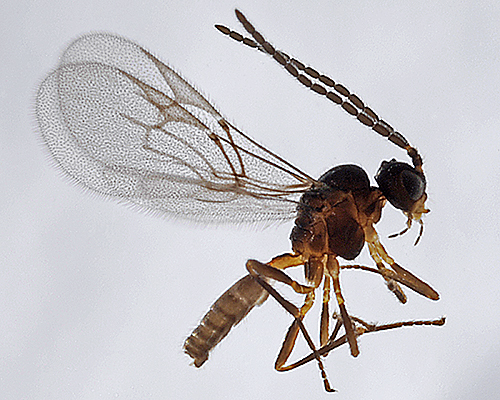 The clarified slide mounts below are of adult viviparous female Nasonovia compositellae : wingless, and winged. We have only found this species in Britain on one occasion - Nasonovia compositellae subspecies compositellae at Dundreggan in Inverness-shire. 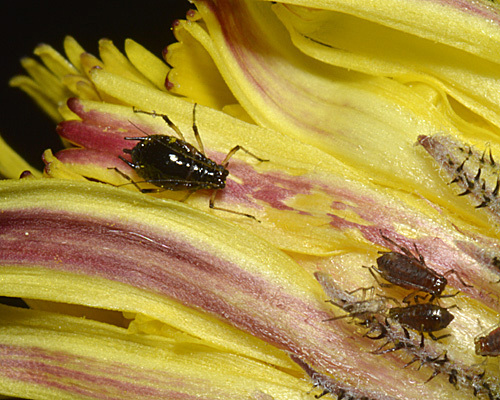 There we found several colonies on Hieracium pilosella. Blackman (2010) comments that most British records so far come from another Hieracium species, Hieracium exotericum. The colonies we found were quite heavily parasitized. 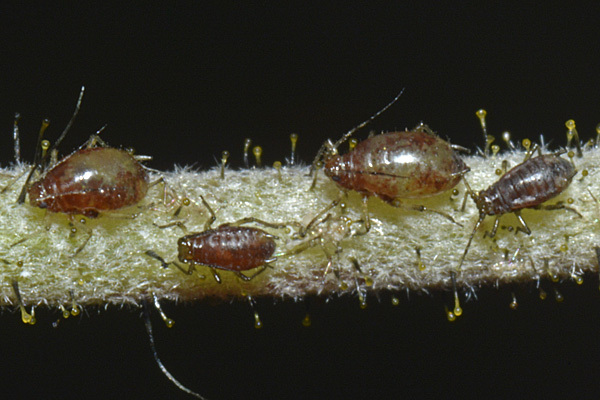 The picture below shows several immature aphids which subsequently turned out to be parasitized. 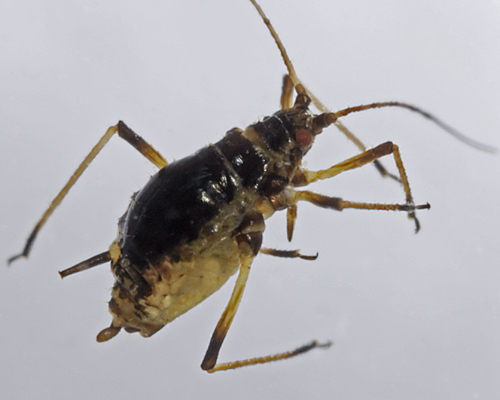 The parasitoid which emerged was identified by Ed Baker as Aphidius hieraciorum. 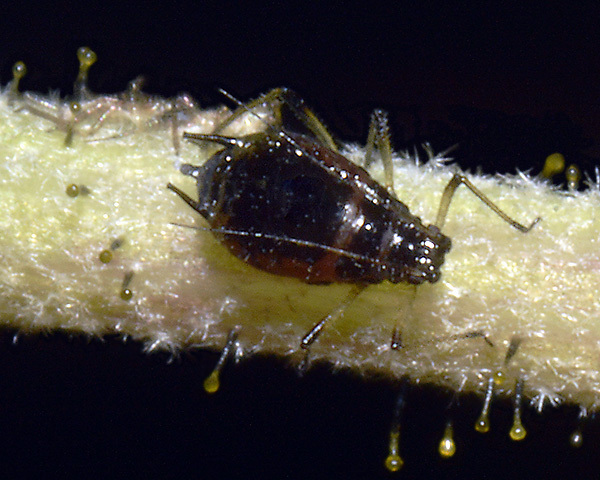 Croft (2007) identified the parasitoid Aphidius hieraciorum (together with the use of resistant varieties) as components for the integrated control of the currant-lettuce aphid (Nasonovia ribisnigri) under the low temperatures and short day lengths of a winter crop. Nasonovia compositellae compositellae (= Nasonovia compositellae sensu stricto) has been recorded on just 5 species of the Hieracium genus (Hieracium deganwyense, Hieracium echioides, Hieracium exotericum, Hieracium vulgatum). Nasonovia compositellae niger has been recorded on 19 species of that genus. Blackman & Eastop list 4 species of aphid as feeding on Hieracium exotericum worldwide, and provide formal identification keys. 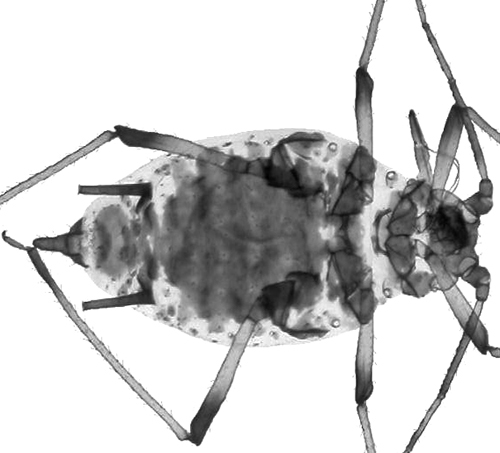 Of those aphid species, Baker (2015) lists all 4 as occurring in Britain: Myzus cymbalariae, Nasonovia compositellae compositellae, Nasonovia compositellae nigra and Nasonovia pilosellae. Nasonovia compositellae niger has been recorded on 3 species of the Pilosella genus (Pilosella caespitosa, Pilosella officinarum, Pilosella peleteriana). Nasonovia compositellae compositellae has not been recorded on any species in that genus. Blackman & Eastop list 18 species of aphid as feeding on mouse-ear hawkweed (Pilosella officinarum = Hieracium pilosella) worldwide, and provide formal identification keys.